Liangjiang International Film City is located in Longxing Industrial Park in the Liangjiang New Area, Chongqing - east of Yulin River, south of Longxing Town, north of Fusheng Town and west of Mingyue Mountain. This film studio complex boasts easy access to public transportation and is near the Korean Industrial Park, Liangjiang Motor City, and a rail transit base. Chongqing is also known for its cultural heritage and scenery – as well as its cuisine and natural resources. The film city is invested mainly by Liangjiang New Area Investment Group, cooperating with the Chongqing Radio and Television Group and Chongqing Film Group. The government also set out political and policy support. These are all factors which make it an ideal choice for shooting and producing films and TV programs. The film city’s management has also implemented a 5-year development plan, known as “five five”, meaning an area of 5 sq km and production of 5 movies or TV dramas. 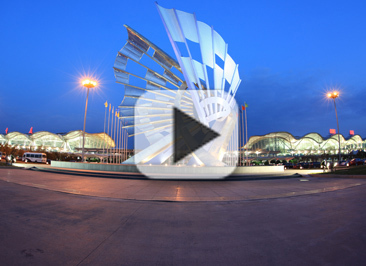 It aims to attract 5 million visitors annually and to realize the annual output of more than 5 billion yuan in 2019.